For further information, see www.ashbournescouts.ie, e-mail ashbournecubs@gmail.com or phone 086 0432355. This universally recognised motto neatly describes the aims and ethos of the worldwide scouting movement. Scouting has been in Ashbourne for over 20 years. Currently, we have three very vibrant sections – a Beaver section, and two Cub Scouts sections. We have just nine volunteer leaders looking after over 50 young people, but we need more, both to allow us to enrich our programme and to take in more children, but also – and most especially – to allow us to reinvigorate our Scout section, which recently lapsed after having been very active in recent years. If you would be interested in becoming a leader, please contact Suzie Rafter on 086 0432355. Scouting Ireland is Ireland’s national scouting movement. It is a multi-denominational, co-educational, youth based association with a membership of nearly 40,000 across the island of Ireland. It is affiliated to the World Organisation of the Scout Movement. Young people join Scouting to be part of a network of young people committed to make a difference in their local, national and international communities. Adolescents are offered a wide range of activities which challenge them and help them to engage fully in civil society. Young people take increasing responsibility for the planning and delivery of their own programme. Young people work in small groups, called patrols. The youth programme for adolescents offers opportunities for young people to prepare their ‘life-plan’ and develop ‘life-skills’. Young people are coached and assisted in developing the skills to participate in decision-making and encouraged to use these skills in Scouting and in society. Young people are supported and guided by adult volunteers on their journey of self-education. Scouting is for young people aged between 11 and 16. Cub Scouts is for boys and girls aged from eight to about eleven. It’s a great way to make loads of new friends and have a lot of fun too! Cubs usually meet once a week in the local scout den but the pack also goes hiking, swimming, camping, to the cinema or wherever you wanna go! The cool thing about Cubs, is that the Cubs themselves help decide what the cub pack does! Each cub pack runs on what we like to call the “gang system”. Each pack is organised into smaller groups called sixes and each six has a leader – one of the cubs – called a sixer. With the help of the sixers, the adult leaders in the group plan exciting activities and games for cubs to take part in! 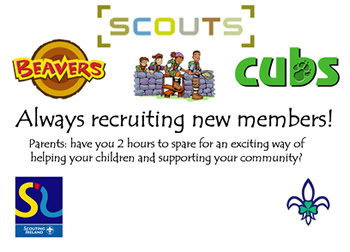 Beaver Scouts is the junior section of Scouting Ireland and is for boys and girls aged six to eight years of age. Beavers usually meet weekly in the local Scout Den and program centres on games, arts and crafts and other activities designed to stimulate the imagination and encourage members to have lots of fun whilst making lots of new friends.